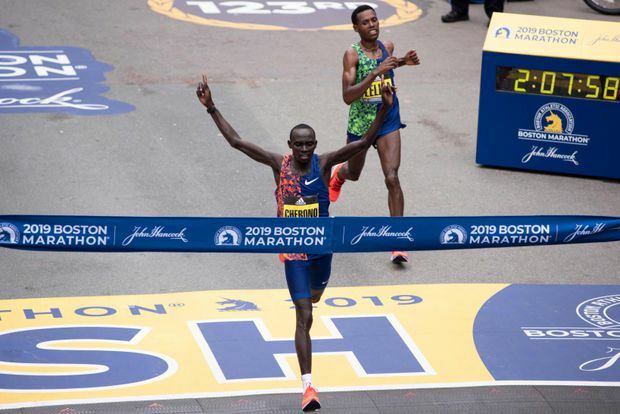 Lawrence Cherono edges Lelisa Desisa for first place in the men's race at the 123rd Boston Marathon, in Boston, Ma., on April 15, 2019. Two-time Boston Marathon champion Lelisa Desisa turned onto Boylston Street with a sliver of a lead, leaning in front of two other runners with the finish line in sight. Women's winner Worknesh Degefa celebrates after the 123rd running of the Boston Marathon, in Boston, Ma., on April 15th, 2019. A field of 30,000 runners followed the elites, ditching their trash bags and ponchos on the Hopkinton Green before embarking on the 26.2-mile trek from Hopkinton to Copley Square. It’s the first time the race has been run on April 15 since the 2013 attacks; officials held a ceremony at 2:49 p.m. to honour those killed and maimed by the two pressure cooker bombs that exploded near the finish line.